Daring jumps, breath-taking tempi: Trumpet Acrobatics! 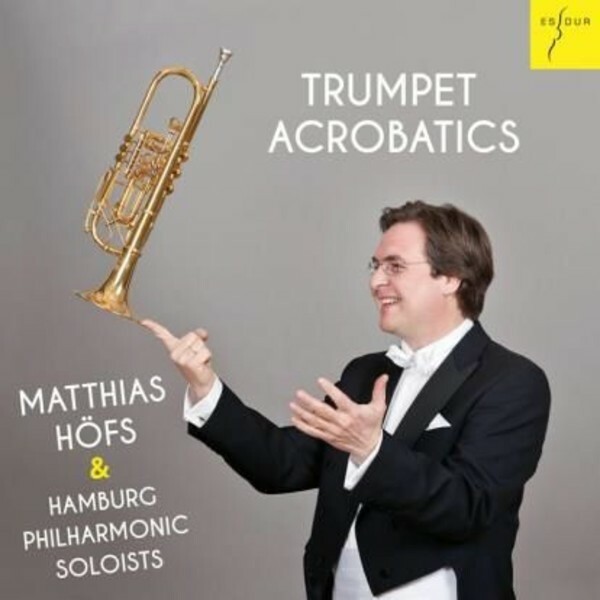 The ease and elegance with which leading German trumpeter Matthias Höfs surmounts the musical and technical challenges of the entertaining pieces on this CD - his second for the ES-Dur label - is captivating. Accompanied by the Hamburg Philharmonic Soloists, the music Höfs performs includes confections such as Bizet’s Carmen-Fantasie, the Concert Piece No.1 in F minor by Willy Brandt, Fantaisie and Variations on ‘The Carnival of Venice’ by Jean-Baptiste Arban, Dinicu’s Hora Staccato, L’Histoire du Tango by Astor Piazzolla, and ‘How Do You Keep the Music Playing?’ by Michel Legrand. In the first third of the 19th century the salon established itself as a reception room in high-society homes and amongst the aristocracy. The term ‘salon music’ first became its own genre of music in 1830 in such rooms, meaning music that is fascinating, effecting, melodious and virtuosic. By the mid-century the repertoire grew to include arrangements of famous pieces and adaptations of beloved opera arias. ETA Hoffmann described such light music as something to be taken “by this beautiful world as comfortably as tea”. Salon orchestras emerged in their own right in the three major musical centres of Europe - Paris, Vienna and Berlin. The piano trio formed its core: piano, violin and cello. The instrumentation presented here from the Hamburg Philharmonic Soloists is almost identical to the salon music of this period: flute, oboe, clarinet, solo trumpet instead of cornet, trombone, string quartet, double-bass, piano and percussion. The arrangements - specifically written for this CD - come from Stephan Pfeiffer, Boris Brinkmann, Peter Lawrence and Matthias Höfs himself.